I am very happy to be part of a dynamic panel of marketing experts and thought leaders, gathering in San Francisco on March 17th, for an active discussion about influence and advocacy in a world of social business. The panel is a joint production between BrightTALK and Think Influence. BrightTALK is a company that provides online events for professionals and their communities. Think Influence is a grassroots community of peers (across industries) focused on the exchange of ideas and best practices on the role of influence in business. Barbara French is the inspiration behind the Think Influence community of which I am fortunate to be a founding member. Below are details about the panel and how to register. WHAT: Social media has enabled business professionals to quickly grow large spheres of influence in targeted industries. These power users hold the key for marketers trying to gain access to their niche audiences. The question is how to identify who the key B2B influencers are, how do you rise above the noise to capture their attention, and how do you encourage them to become advocates for your brand. WHEN: March 17, 2011, 8:00-8:45am PDT. Also available for replay. Attend onsite in the panel audience or for a breakfast reception afterwards with the panelists. By invitation only. Space is limited. Join theThink Influence group on LinkedIn to request an invitation. COST: Free, however registration is required for the live webcast and replays. Onsite event is by invitation only. SPONSORSHIPS: Contact Barbara French for info on sponsoring Think Influence events. Contact BrightTALK for sponsoring their Social Media Marketing Summit. ABOUT: This event is a joint production of Think Influence and BrightTALK. Think Influence is a grassroots community of peers discussing the role of influence in business. This year’s SAP Influencer Summit was not only a successful model for influencer engagement, but an excellent example of Tom Foremski’s quote: “Every Company is a Media Company.” SAP’s amazing team of communication, marketing and business professionals just wrapped up their 2010 Annual Influencer Summit in Santa Clara, California. Through the event we are able to provide these important industry professionals with the information they need to better understand SAP’s strategy (as it evolves); the progress we have made in delivering on the strategy (throughout the year); and highlight what we will deliver over the proceeding 12-18 months. It is an event that has helped to keep SAP honest, accountable and focused. It is also an event where the influencers ask (with great encouragement) very tough questions and challenge SAP. Because of the great advancements and effiencies of social and collaborative technologies we are now able to expand the scope and ‘influence’ of the summit without a dramatic increase in cost. In 2010, SAP’s marketing organization made tremendous investments to co-develop an online virtual event platform with our partner vcopious that we used to support the summit. As background, Gideon is a pioneer of the IT advisory industry having founded Gartner Inc in 1979 and GIGa Group in 1995 (acquired by Forrester in 2000). By many measures Gartner and Forrester are (today) the dominate forces in their industry. Barbara is a highly regarded thought leader, advisor and consultant to the IT vendor community helping analyst and influencer relations professionals adapt to changing landscape and market influence of analysts and other influencers types. The discussion that Barbara and Gideon started is based on the observation that the IT advisory industry is going through a new and important phase in its maturity. In essence, the question they pose is to what extent will smaller research and advisory firms and the growing rank of independent analysts disrupt the business models that the current dominate players have been founded on? The discussion has generated a good deal of attention and commentary among industry observers and professionals in the IT analyst and vendor community. I have received several emails from colleagues and peers in the industry wondering ‘why I have been dark’ on my blog for the past two months. Like many marketing and communications professionals I have been heads down in business - making adjustments to programs and activities for the remainder of 2008 and planning for 2009. To say the least, the affects of the financial crises and daunting uncertainty across global markets has put significant pressure on companies to aggressively manage both the bottom line (expenses and operational budgets) and top line growth (sales and revenue generation). This intensive thrust to ‘back to basics’ management impacts all departments and organizations. Managers are required to make adjustments to their operations to become laser focused and efficient AND deliver more value and results (and some cases - much more) with less resources (and in some cases - much less). These circumstances pose a number of challenges for many marketing and communications professionals to adapt to. I personally have an optimistic view of the situation. Looking back at history, the market goes through a correction once every 10-15 years (e.g. recession in the late 80s; and the dot.com bubble bust in 2001). Our current situation is definitely the worst ‘correction’ in several decades, but nonetheless a correction it is. Although tough and challenging to go through, what history shows is that numerous product, service and technology innovations tend to emerge out of each market correction or crisis. All of which fuel new business models and market and career opportunities. These innovations come (in part) through a flushing of inefficiencies, consolidation of ‘players/companies,’ and a refocus on creating and providing more value. The companies that plan and adapt appropriately will be the big winners (both old and new companies). As a communications executive, I see this as a great opportunity. The power of thought leadership, relationships and collaborative industry influence that largely extends from programs driven by communications departments is a great ‘currency’ that gains tremendous value in any economic recession or down turn. As communication practitioners, our role in helping to guide the market renewal process is critical. The results delivered through well structured communication and influence programs do not require huge budgets or mega teams to drive. The effects of positive ‘unpaid media,’ external thought leadership and word-of-mouth and advocacy programs delivered through successful press, analyst, blogger, customer, employee, community and other influencer relations programs costs very little to execute AND generates very high returns for your company. The benefits can be realized through the advancement of your company’s competitive position; positive reputation management; validation of new market/business opportunities; and 3rd party education, thought leadership and best practices that increase visibility and confidence that your business is a valuable and smart investment (for shareholders, customers, partners and employees). Further to this, the use of existing technologies and social media strategies (among other things) offer marketing and communication professionals a tremendous and low cost way to disseminate messages with great scale and build awareness and maintain relationships with influencers (internal and external) in an increasingly global and dynamic business environment. I believe that 2009 will bring a number of significant and positive changes to the marketing and communication profession. I predict that we will see greater adoption and more innovative use of social media; new designs of communication and marketing organizations that adapt to a new influence ecosystem; more focus on customer and ‘community’ engagement; new metrics and measurement designs; and increased ‘insight’ programs to support corporate decision making. These changes will contribute to a much needed renewal of marketing and communications that will help to evolve our profession to become more strategic, vibrant and valued across all industry sectors and geographies. I encourage all of my industry peers and colleagues to take advantage of this opportunity with an optimistic outlook. Challenge yourselves to better understand your business and industry environment. Look for new opportunities to provide value. Understand how to better use the ‘process’ of communications and the power of relationships to advance your company’s position in the industry and drive positive awareness, thought leadership and confidence back into the market! And lastly - be bold, be proactive, and be proud!!! During the design phase of the Industry and Influencer Relations (IIR) program at SAP (in 2006) we conducted extensive research to understand who the decision makers are in our market when it comes to purchasing business software and more importantly who influences these decision makers. It was a six month project that returned some very interesting results that supported the decisions made in designing the IIR program and team structure. I would like to share a nugget of information gathered from our research - based on results for the U.S. market. Small and mid market decision makers rank industry analysts and analyst executive programs much lower level than the large market. Observation: No real surprise here as the business and engagement models of most analyst firms do not cater to the needs and budget constraints of small and most mid-sized companies. 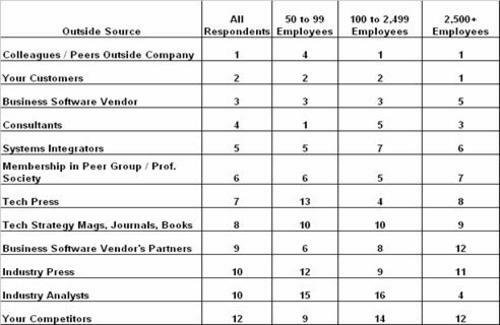 Mid market decision makers rank press (Tech, Job Function, Gen’l Bus. ), business software vendor partners & board of directors, higher in influence. Observation: One conclusion could be that most mid market companies have ‘just enough’ experience and sophistication with business software that the quality of information and insight reported by the media about industry trends, vendor reputation and best practice provide decision makers enough information to form opinions that require less dependency on 1:1 interaction with 3rd party experts – such as industry analysts. 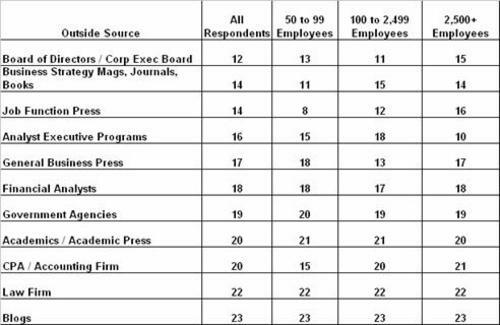 Small companies rank most forms of publications (tech/business press, books, etc.) as low on influence, indicating a much higher level of trust to consultants, peers, and software vendors. Observation: Small business owners either don’t have the time to read or the issues relevant to them (related to business software) are not adequately being represented by media (maybe too high-level or not representative of core issues) so they rely more on peers, consultants and other trusted advisors for insights. Observation: I suspect that this may have changed in the last 18 months as more consultants and industry experts have adopted the use of blogs to syndicate their research and insights to fuel their consulting business models. You can draw additional conclusions from these rankings. We plan to update the research later this year to track and analyze trends and changes. I suspect that most of the changes will be in the lower half of the rankings, however. The comparison of the U.S. findings against emerging/growth markets such as China, India, Brazil, Japan, and Russia are very interesting. Each of the above mentioned countries have very distinct ‘influence ecosystems’ affected by the importance of relationships, culture and politics. For global or multinational companies doing business in these countries, it is critical not to over or underestimate the cultural and sociopolitical factors when establishing influencer strategies and programs. This post provides additional background on the Industry and Influencer Relations (IIR) program that I introduced in an earlier post. Through our research we have found that there are generally three factors of influence that affect any type of decision. In SAP’s case - three factors that affect a decision to purchase business software. As an example, let’s say that you are the CEO of a $1m apparel company. Your product is fantastic, you have had great success and you want to expand your business. You have created a masterful five year plan to increase your apparel and accessory lines, create partnerships with manufactures and retailers, open up boutique retail stores, create an online retail presence, and increase investments in sales, marketing and of course top talented people. Part of your plan requires investment in a business software solution to help you plan and optimize resources, manage HR, finance, etc. So, where do you start? You are generally aware of SAP, Microsoft and Sage as vendors but you have no professional experience with any of them - with the exception of basic use of Microsoft office products. With your limited awareness of these business software vendors you invest time in research and education to support your decision. You talk to peers in your industry – perhaps through a social network or an industry association; you do an online Google search for information and find research reports and relevant articles in business and trade publications; you may also identify and speak with an analyst or an industry expert for opinion. The point is that you rely on multiple sources for insight, education and advice to support your decision – often times well before you even speak with a prospective vendor. In each case, you form an opinion based on the reputation of the vendor through others’ experience - where you have none. Within the IIR team we have done the homework to understand where decision makers of business software solutions go for insight, education and advice to support their decision and how important those sources are in influencing the decision. This insight is the basis for the design of the IIR team at SAP. We have identified and are actively engaging with the individuals – be they bloggers, academics, analysts, or consultants; virtual communities, associations, partners, and groups that have the highest impact on purchase decisions. Our engagement model is multi-faceted. The mission of the IIR team is to enable sales execution and accelerated adoption of SAP’s products and solutions. We do this by generating positive experience of SAP’s brand, products and reputation within strategic business and IT communities of influence that have a $44B influence on business software decisions, annually. I ran across a good definition of Influencer Relations some time ago which identifies the function as a systematic way to identify, measure and build bridges with influential people who impact customer perception. To provide coveted 3rd party validation and recognition of our business strategy, products and overall market leadership. The first involves building deeper, lasting relationships between the company and the influencers. The second entails finding specific ways to help every influencer become a vocal and active champion of the company. The third is to create a lasting dialogue of mutual benefit. We are in constant interaction with our influencers and communities providing education and working with them as consultants, advisors and net promoters of our business and product strategy. Often times we engage with the intent to exchange valuable insights that ultimately influences each of our views. We also look for every opportunity to expose our influencers to customers in an effort to channel the positive experience of our customers through the influencer’s interaction with decision makers both directly with prospects (as a service) or indirectly (through a blog, book, research report, or at a conference presentation) to support SAP’s position. We have explored the business and governance model of each influencer group/community around this circle. Each has a very unique and powerful value proposition that factors quite heavily on their engagement with customers and ultimate impact on purchase decisions. As such, we have established equally unique engagement models to work with and mange the relationships and needs of each group. We have gone even further to calculate the monetary impact that these influencers have on purchase decisions. This valuation is based on extensive research to understand how decision makers (with budget authority) engage with influencers to support their decision to purchase business software. The figures listed in the chart are based on the influence of SAP’s $75B market opportunity. IT influencers such as industry analysts and consultants make money by providing research, education and advice in which the demand is generally fueled by confusion in the market ☺ They educate customers and prospects through written research, presentations, 1:1 conversations, and through the media. Their expertise and established credibility in the market with customers, vendors, media and the financial community have established them as market makers. Our estimate is that these influencers have a 10B impact on SAP’s market opportunity of $75B. Early engagement with these influencers allows bi-directional influence of our strategy. If managed successfully, these influencers will take ownership of our strategy and position. Their ‘ownership’ creates inherent advocacy driven through their own thought leadership platforms allowing them to provide greater insight, education and advice to potential buyers in the market which in the IT industry analyst example - drives business for them. We are creating win-win partnerships. Equal to the IT Influencers there are very important individuals, communities and social networks that have significant affect on the agendas of business level leaders in the c-suite such as the CEO, CFO, COO and GMs. These groups of decision makers have very specific needs when it comes to looking at trends in their industry be it retail, banking, or any of the many manufacturing vertical markets. We have identified the people and communities that drive thought leadership and consult with business decision makers at the highest levels. Our engagement model here shares many similarities to the way we engage with IT influencers: early and constant. Customer communities and peer groups have the highest influence on purchase decisions, largely based on the credibility of their experience (as customers) using and implementing our solutions. As previously mentioned, there are 30+ SAP User Groups around the world that represent about 80% of our installed base of customers. One-by-one we are building powerful relationships with these communities which vary in size from the 2000+ companies that make up the Americas User Group, to the 250+ SAP customers that make up our user group in Brazil. What is interesting about the group in Brazil is that this relatively small number of member companies (SAP customers) represents well over 60% of Brazil’s GDP. This is an impressive statistic that underscores the power and influence of community – no matter the size or geography. Peer groups (in large part) exist because they want to be heard and ensure that their interests are well represented in corporate and development priorities and decisions. They want to show their ability to wield influence and affect policy and engagement. They also gather for the very important purpose of networking and sharing best practices. Significant challenges quickly come about if a company ignores or mismanages these important groups – that are organized by a shared purpose of influence. The biggest being backlash in media and affects of negative word of mouth that can be viral and destructive if not well managed. Partners wield significant influence on customer purchase decisions. As much as we would like, our customers’ IT landscape are not homogeneous. Our customers and prospects work with and rely upon a number of IT vendors to support their success. The Partner Communications program is designed to support SAP’s most strategic partners and partner programs that fuel the highest revenue opportunities within SAP’s ecosystem. Our objective is to gain maximum communication value out of these partnerships by executing joint and integrated (with the partner) communications campaigns to drive thought leadership, awareness, and general education of the joint value – allowing SAP the opportunity to ‘catch draft’ off of our partner’s invaluable brands and activities - and vice versa. Universities play a very unique and important role in the ecosystem of influence. They are in fact the most strategic community around this circle. With an understanding of the power that ‘experience’ has in influencing decisions - the purpose of the university alliance program is to build SAP experience into the next generation of business and IT decision makers and leaders - at the core of their pre-professional education. We do this by providing universities with access to SAP systems for teaching and working with them to develop business and IT curriculum. The program generates skilled graduates that help to secure the investments of SAP customers and partners (as they are hired on). These students will also evolve to become important IT and business influencers and thought leaders in their own right - which fuels the circle of influence. If there is interest, I will provide (with appropriate detail) additional case examples and engagement scenarios associated with our programs. These are good KPIs to support the effectiveness of program execution but they do not support the most strategic metric (if you are a sales driven business J) of actual influence on deals won and lost. Pipeline Analysis: Leverage your company’s CRM or sales management tools to understand which (if any) influencers are impacting your deals. This allows you to map the influence of analysts directly to sales – the ultimate metric to secure strong executive support of time and budget to support the execution of your programs – as well as helps you understand where to appropriate your time and tier/rank the influencers with whom you work with. Win/Loss Analysis: Integrating key questions into your company’s process for tracking win/loss intelligence will provide you with the definitive impact (positive or negative) of influencers in your company’s deals. How many prospects entered your pipeline as a result of the event? How many prospects that were already in your pipeline (who also attended the event) resulted in closed deals? This approach is good to use with all influencer types (media, peer associations, partners, etc. ).to understand who your prospects are relaying upon for research, education and advice to support their decisions. The information gathered from these metrics will help you to effectively rationalize which influencers you should work with and why. My bet is that you will find that many of the assumptions that you currently use to tier your influencers and appropriate resources against (people, budget, executive time) are not geared to the enabling the sales effort in the most effective ways. In January, Carter Lusher from Sage Circle asked a question through Linkedin Answers about “The biggest challenges that tech vendor analyst relations (AR) teams will face in 2008? The biggest challenge for the next 18 months is the marginalization of the traditional AR function. Many of today’s AR ‘practices’ are based on antiquated engagement and relationship models defined over a decade ago. In order to maintain strategic relevance, the AR practitioner needs to understand the problem(s) that they are really trying to solve for their company and demonstrate how ‘the process’ of working with analysts and IT Influencers can help solve them. As you go through the exercise of really understanding your company’s business challenges, you may realize that the analyst engagement models of the past will not help you (entirely) secure the future opportunities for your company. Looking beyond the traditional engagement with the big 3 or 4 analyst firms in your industry (choose from Gartner, AMR, Forrester, IDC, Ovum, Yankee, etc.) you will find that these firms have limited scope of 1:1 influence - relative to the true market opportunities that your companies may be targeting. Gartner (as an example) has about 15k customers (of which 30% are vendors). The global market opportunity for vendors targeting the Large Enterprise market is about 80k customers, and for SME it is about 57million! Who are the influencers reaching the 99 percent of the market that your company is targeting??? This is not to say that the 1 percent of companies that the traditional analyst firms influence are not important! However, if we are in fact entering a recession, then growth for our companies will need to come from new markets and most likely new customers. Perhaps it is time to challenge ourselves to rethink the traditional AR approach that was cast over a decade ago? If we do not innovate our approach, the value of the traditional AR manager will be marginalized as our precious resources (stakeholder time and budget) will be diverted to other high return marketing and communication activities that target new/expanded high growth opportunities for our companies.